Uncategories What is cupping (hijama)? Cupping (hijama) is the best remedy recommended and used by the Messenger r. The Messenger r said, "Indeed the best of remedies you have is cupping (hijama)…" [Saheeh al-Bukhaaree (5371)]. He r also said that on the night of Israa (his ascension to the heavens) he r did not pass by an angel except that it said to him, "Oh Muhammad, order your Ummah (nation) with cupping (hijama)." [Saheeh Sunan Tirmidhee (3479)]. This shows the importance and greatness of this Sunnah. 'Hijama' in arabic is derived from 'hajm' which means 'sucking'. Cupping (hijama) is the process of applying cups to various points on the body by removing the air inside the cups to form a vacuum. Dry cupping (hijama) - This is the process of using a vacuum on different areas of the body in order to gather the blood in that area without incisions (small, light scratches using a sterile surgical blade or). Dry and massage cupping (hijama) may be self-administered in the comfort and privacy of your own home. Each cupping (hijama) box is accompanied by an instruction booklet. We have also provided further instructions on our 'How To Cup' page. The Messenger r said, "For every disease there is a cure so if the medicine comes upon the disease it cures it by the will of Allah, the Most High." [Saheeh Muslim (2204)]. Wet cupping (hijama) - This is the process of using a vacuum at different points on the body but with small incisions in order to remove 'harmful' blood which lies just beneath the surface of the skin. (It is recommended that wet cupping (hijama) is only administered by a cupping therapist). We will run cupping (hijama) courses for wet cupping (hijama) inshAllah. Please join our FREE newsletter and we will keep you updated inshAllah. 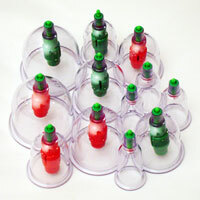 Wet cupping (hijama) is best administered at certain times of the day and days of the week. Please see our 'Authentic Narrations' page for further details. Wet cupping (hijama) is from the Sunnah. To obtain maximum benefit from cupping (hijama), it is recommended that all three methods of cupping are used. Is cupping (hijama) a cure for every disease? Cupping (hijama) is a cure for every disease if performed in its correct time. The Messenger r said, "Indeed in cupping (hijama) there is a cure." [Saheeh Muslim (5706)]. r said, "Whoever performs cupping (hijama) on the 17th, 19th or 21st day (of the Islamic, lunar month) then it is a cure for every disease. "[Saheeh Sunan abi Dawud (3861)]. There are specific points on the body where the cups are applied for each ailment. Please see our 'Where To Cup' page for further details. Above are just some of the authentic narrations which show that cupping (hijama) is from the Sunnah of the Messenger r. Please see our 'Authentic Narrations' page for more authentic narrations about cupping (hijama). The Messenger r said, "Whoever revives a Sunnah from my Sunnah and the people practise it, s/he will have the same reward of those who practise it without their reward diminishing…" [Sunan ibn Maajah (209)].